This Prophecy was fulfilled when an altar was consecrated By the Lord Himself according to the Holy Tradition at the St Mary Mooharak Monastery at Assuit. 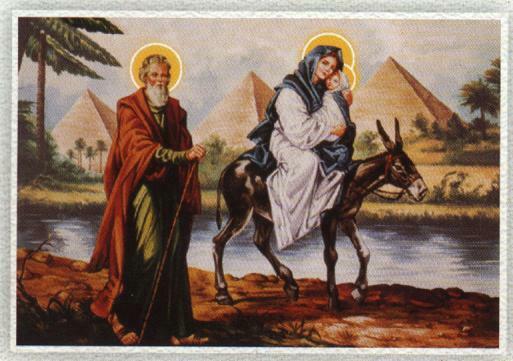 Geographically the spot on which the altar is situated in the middle of Egypt "And a pillar of the Lord at its border" (Is 19:19) Again the Holy tradition explained that this prophecy was fulfilled by the entry of St Mark the Apostle, the Egyptian lands preacher, to Alexandria at the border of Egypt. The Lord is waiting to enter the door of our hearts. May the Lord Support us to allow Him to enter our hearts and minds " Behold I stand at the door and knock, if any one hears My voice and opens the door I will come to him and dine with him" (Rev: 3:20). It is said that we are born without our will but we can not be saved except when by our will we accept the Lord in our hearts. That is why some painters draw the picture of the Lord knocking on a door that has no door knob from its out side. May we open our doors and hearts to the Lord when He comes knocking at our door.